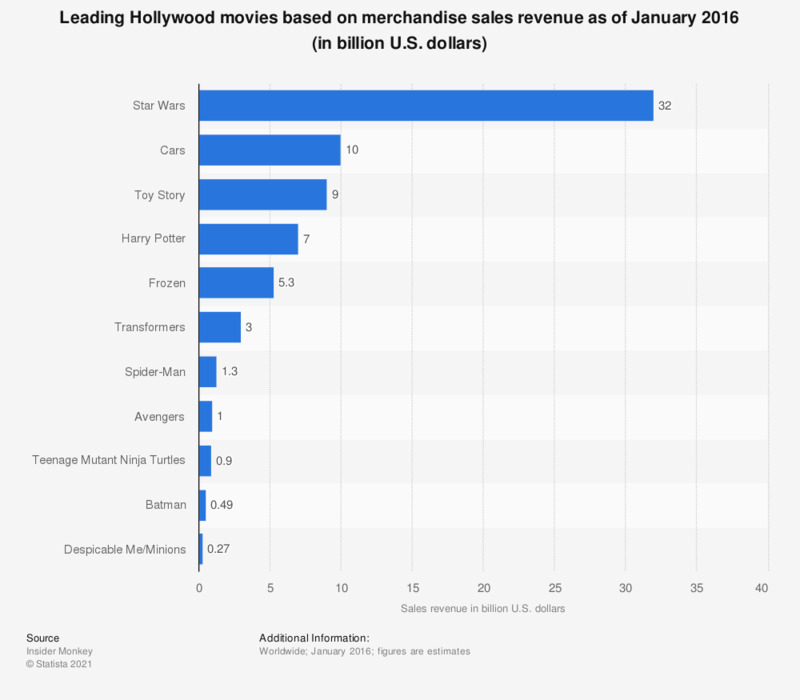 The statistic presents the leading Hollywood movies ranked by merchandise sales revenue as of January 2016. According to the estimates, the "Despicable Me" franchise, including "Minions", earned 267 million U.S. dollars in licensed merchandise as of the measured period. "Cars" ranked second, with 10 billion U.S. dollars in merchandise sales. At the top of the ranking was the "Star Wars" franchise, which generated merchandise sales revenue of 32 billion U.S. dollars as of January 2016. The latest movie in the series, "Rogue One: A Star Wars Story", cost 200 million U.S. dollars to produce and generated almost 1.1 billion U.S. dollars at the global box office. As a result, the movie was the second most popular movie of 2016, beaten only by "Captain America: Civil War", which generated over 1.15 billion U.S. dollars worldwide.